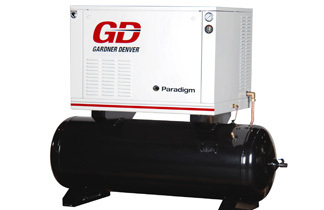 Gardner Denver Paradigm Compressors provide the advantages of a reciprocating compressor, coupled with less noise and vibration. Loaded with rugged features, these compressors deliver high-performance and tremendous value. As a result, Paradigm compressors offer long, trouble-free service with maximum operating efficiency. Separate compressor and motor chambers with dedicated cooling circuits for cooler operation and longer life. Oil site gauge for ease of monitoring and service. Integrated heavy-duty air cooled aftercooler for up to 65% moisture removal. Filter maintenance indicator for user-friendly monitoring. The graduated indicator monitors the compressor air filter. The position indicator progressively fills the window as air filter restriction increases and indicates the need for a filter change. Industrial grade compressor with unique features including gasketless cylinder/head design, stainless steel valve disks and tapered roller main bearings for superior dependability. Integral cylinder and head eliminating the possibility of blown head gaskets for leak-free, trouble-free operation. Balanced aluminum alloy first stage piston(s) are weight matched to the cast iron second-stage piston(s) for proper balance and minimized vibration. Lightweight, high-density, die-cast aluminum alloy connecting rods for minimal reciprocating weight. Precision-bored crankpin bearing and piston pin needle bearing are used to properly distribute bearing loads for longer bearing life than bushings. Industrial grade, reliable, high-flow, low lift disc-type valves are made of corrosion resistant Swedish steel to ensure years of trouble free operation. Tapered roller-type main bearings, providing full contact and support of the crankshaft, ensuring compressor durability and long-life. Unique domed piston design for maximum air delivery and efficiency.